Do you need a Comedy Entertainer for your next event? 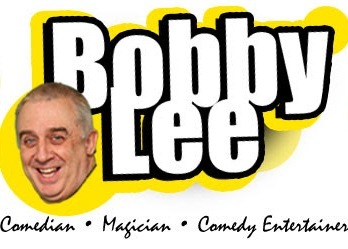 Bobby Lee has over 25 years experience as a Stand Up Comedian and Magician and Comedy Entertainer. Shows are completely inoffensive and suitable for audiences with or without children. For cruises, Bobby has a 4 x 45 minutes spots available. Bobby is a competent Magician; able to perform various forms of magic, Close Up, Stage/ Cabaret or Childrens' Magic. His Stage show includes Mind Reading, audience participation if required, slant is generally on comedy, but can perform as a serious magician if required. Bobby also has a dedicated Children's Magic Show with comprises of 45 minutes of interactive comedy magic. Suitable events such as: Weddings, Functions, Cabaret, Charity Days, Corporate Events, Golf Days, Sportsman Lunch, After Dinner Speaking, Office Parties, Product Endorsement, Promotions, Conferences, Magic Conventions, Family Nights, Exhibitions. Typical Venues Include: Working Mens Clubs, Social Clubs, Theatres, Television, Cruise Lines, Cabaret Venues, Military Bases, Holiday Parks, Family Homes, Fetes, Shopping Centres, Residential Homes, Nursing Homes, Restaurants, Hotels and many more venue types.